John Micallef has written a fascinating book on a fascinating family, spanning 236 years. Putting flesh on the Scicluna family tree and giving it life, Micallef ensures the saga is skilfully interwoven into the island’s history, thus making an important contribution to our heritage. Those attempting biography in Malta face special obstacles: a widespread reluctance to put pen to paper, sparse records and closely knit families reluctant to share their affairs with outsiders. These are but a few of the obstacles authors face. To a great extent and to his credit Micallef has overcome them. A recent article appearing in The Times (of London) asked ‘Can serious biography survive the cult of celebrity’? The writer recalled how a life of Matisse, the celebrated French artist, sold 12,000 copies in Britain, while one on Katie Price, known as ‘Jordan’ (a former Page Three girl) shifted 335,000. 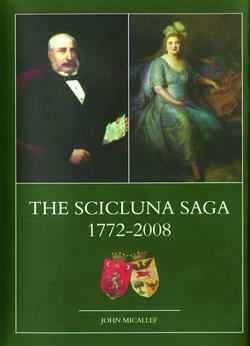 The strength of the Scicluna family lay in financing trade through their own bank, which they established in 1830. Bankers, brewers, eccentrics and philanthropists amassed a fortune but their sense of philanthropy was prodigious. The second Marquis, to take but one example, was responsible for setting up the Fra Diegu Institute, today a household name. His uncle, Emmanuel Scicluna, the first Marquis, was ennobled by Pope Pius 1X, in recognition of his generosity at a time when the Vatican was going through lean times. John, the third Marquis, married Maria Violetta Testaferrata Moroni-Viani, Baroness of Tabria. She was sociable and enjoyed entertaining lavishly. She travelled extensively – as far afield as Venezuela, whither she went with her two sons and one daughter, Mignon, soon after the Berlin airlift fearing that Europe would fall into Joe Stalin’s Bolshevik lap. The experiment ended when Patrick suffered sunstroke they all returned home. Both she and her husband undertook works of charity; there were over 100 refugees billeted at Dragonara Palace during World War Two. The Marchesa organised concerts in aid of the Malta Relief Fund, the Spitfire Fund and the Sanatorium Fund. Her husband set up The Marquis Scicluna Trust Fund to help needy students and retained four beds at the Blue Sisters hospital for use by the less wealthy. In the field of commerce and industry he first built his own brewery and later merged it with with Simonds-Farsons, a venture that turned out to be an outstanding success story. On a more modest scale, the family reminds one of the Medicis. Like them they had their ups and down – it was not all beer and skittles. Tragedies and failures formed part of their lives, but their achievements triumphed and overcame them. Micallef sketches warm and colourful portraits of various members of the family, kicking off with Joe (the fourth Marquis) an eccentric whose architectural ‘folly’ Mystique, (in Madliena), I had nicknamed ‘Bats in the Belfry’ when I first saw it. The Scicluna family were the owners of some of the grandest properties in Malta: the Palazzo Correa in Old Bakery Street (destroyed during the Second World War and then re-built to house St Albert the Great College); the splendid Dragonara Palace, the very impressive Palazzo Parisio in Naxxar and Balluta Buildings in St Julian’s. All now form part of Malta’s rich architectural heritage. There will be those who find it disappointing to find nothing in The Scicluna Saga which throws light on the cause or causes of the run on the National Bank of Malta in 1973. This led to the take-over of that institution by the Socialist government. The real reason for the run on the bank remains a mystery, though the then government’s record of taking over various enterprises would not have helped. The business acumen of the older Sciclunas has not passed today’s younger generation by. To quote one example, Marie Christianne (Muffy), daughter of the 12th Baroness of Tabria, has made a splendid success in refurbishing Palazzo Parisio, (Naxxar), with its delightful garden.